While this house was not designed by Harris Armstrong, it is an authentic, if eclectic version of a pre-war Art Moderne home. I do not know the house's architect or the house's history. 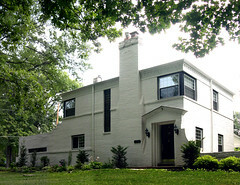 However, it has some features in common with other significant Saint Louis homes of this period and style. Such homes would include one designed by Charles Eames, one by Edouard Mutrux and one by Harris Armstrong. 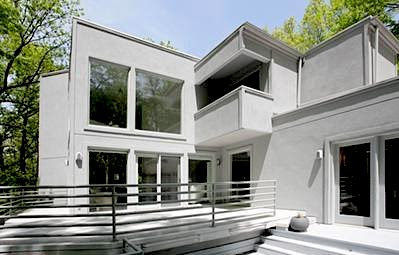 I learned of this house being listed recently from Ted Wight through his blog St. Louis Style. 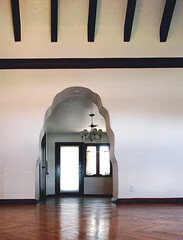 According to Ted's site, the listing is through Greg Leber with ReMax Premier Realty who can be reached at 314 609 7390. You can find the current real estate listing (with ReMax) here. I would be interested in information, photos, or other pertinent details on this unique Kirkwood home. You can see my other photographs of this home here. 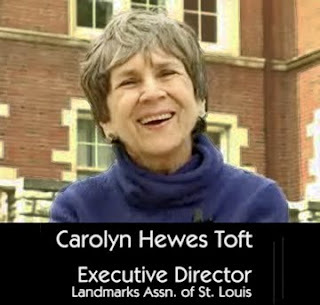 Check out this brief video on StL Beacon to see our own Carolyn Toft speak on the importance of historic preservation !